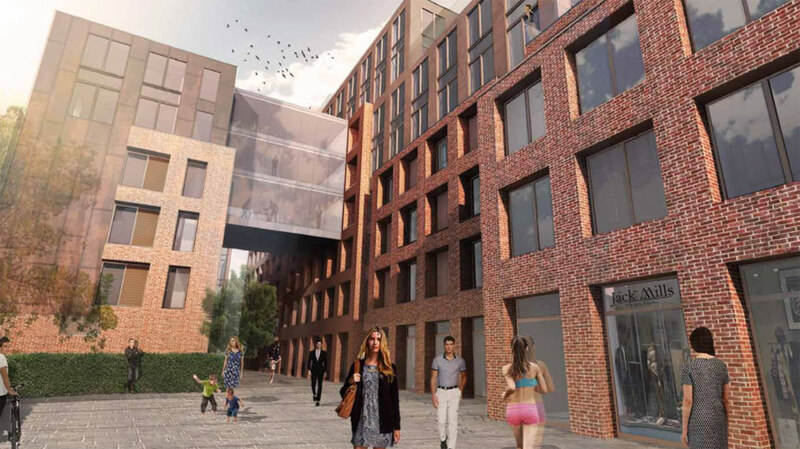 Proposals for student housing blocks comprising 300 bedrooms, including a gym and ground floor space for retailers and restaurants, are hoped to form a gateway between Lincoln High Street and the Brayford Waterfront. The plans, designed by Stem Architects Ltd, have been submitted to City of Lincoln Council on behalf of Network Rail. Constructed parallel to the central railway line, two buildings would sit behind the ongoing University of Lincoln Sarah Swift Building on Wigford Yard and front the High Street, next to the new level crossing footbridge. A walkway will be paved through the site between Brayford Wharf East and High Street. One three to nine storey block would accommodate 38 residential flats [totalling 250 bedrooms], a 75 square metre gym and 735 square metres of retail, restaurant or cafe use on the ground floor, looking out on to High Street. The second building would be a six storey annex to accommodate six flats [51 bedrooms], connected by a glass walkway. The site currently houses the now derelict brick and concrete building which once accommodated the old Superdrug and Bedshop High Street stores. The proposals are updated from previous plans which were approved by the city council. Plans previously suggested the refurbishment and extension of the existing building at 179 High Street. The applicants stated: “Due to its proximity to the existing railtrack and a heavily contaminated (asbestos) ridden structure, it is not viable to convert the existing building. Nigel Stevenson, Director at Stem Architects, said: “The 179 High Street project completes the High Street pedestrian bridge project and forms an integral part of a wider regeneration programme in the Brayford area. “This connection will also work in tandem with both the new High Street and Brayford Wharf East level crossing footbridges to improve pedestrian permeability throughout the whole Brayford area. Proposals will be considered by City of Lincoln Council’s planning committee at a later date.